Pinewood Derby Kits handed out. Contact your Den Leader if you miss this meeting. Practice Pinewood Derby at St. Paul's Church. No check-in necessary. It is highly recommended that you participate in this as leaders will be on hand to assist with a weight check and we'll have some basic tools to help out if you need it. The scale is the same scale as we use the following week at the derby. The scale will be available during from January-February for car weigh ins. Only den leaders should be using the scale. [Insert Date], check in starts at 8:30am, racing begins at 9am sharp (Tigers first). Pack 874 Pinewood Derby at St. Paul's UM Church. We can use some volunteers for Derby Day. Leaders should plan on being at the entire event. After each group finishes, we will present awards and immediately start the next group. Please consider staying to cheer! 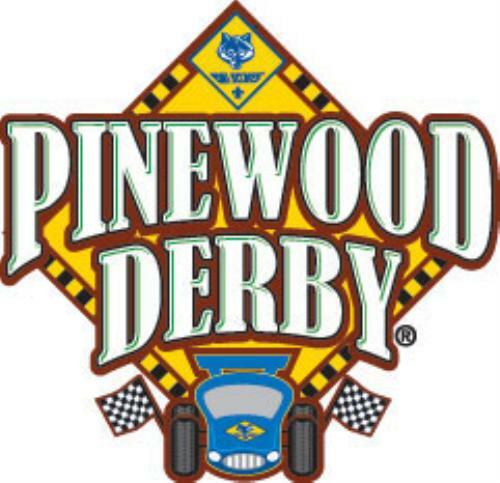 All derby cars must meet the specifications as defined by the Three Rivers District Pinewood Derby Official Rules. Take the time to carefully read the the official rules in the attachment below. In order to have an equal field of competition, PRE-CUT OR PREFABRICATED KITS will be placed in the OPEN heat and will not qualify for districts. The check-in official will ask each participant if they use a prefabricated kit. You must use an official BSA pinewood derby kit. You may not substitute the block, wheels or axle from any after market items. The car must be within the specifications outlined in the rules (length, weight, track clearance, etc.). ALL four wheels must be touching the track. Cars not within specification will be disqualified. Please make every effort to keep the car legal and within these specifications. The practice derby is a good chance to have your car "inspected" by pack leaders. We will also offer some assistance with weights and wheel placement. Leaders will not have time to offer assistance with car adjustments on derby day as we will be busy with other tasks. Two cars will race on the outer tracks which will be designated "Track 1" and "Track 2." For each heat, the starting track will be assigned by the race management software. Each heat is double elimination (you must win two races to win the heat). When a racer loses a heat, he will be assigned one elimination point. Once a racer reaches two elimination points, he will be eliminated. To determine 2nd and 3rd place, a tie breaking heat will be completed. ***Car off track*** - We make every effort during pre-race set to align the track in order to prevent cars from falling off. In most cases, cars off track are due to wheel alignment problems. However, if the pit crew determines the track needs adjustment, we will do so. If a car falls off the track once, it will be given the opportunity to redo that race. The pit crew will inspect the track to determine if there is a problem with alignment. If a car falls off the track two times in a row it will be considered a loss. Scouts, parents, and family members are expected to conduct their behavior according to Scouting's principles. The Race Chairperson or race official will handle all controversies. Decisions are final and are not subject to discussion during the event. On race day, a spectator area set up. If you are not racing, we expect that you stay in the spectator area. Please remain in the Fellowship Hall during the race. When called, Scouts will enter the racing area and sit behind the track. Each racer will be called by name and he will retrieve his car and hand it to the pit crew member who will start the race. To prevent damage to derby cars, Scouts should only handle their own car. The pit crew member will launch the cars and the Scouts will retrieve their car at the finish line and bring it back to the launcher. When the heat is finished, the Scout will place his car back in the designed holding area. We understand that sometimes the blocks break when they are being cut, shaped, or sanded. If you damage your block beyond repair, we usually have extras for $5.50. You may also may purchase an extra official BSA kit from the Scout Shop in Waterbury, Scoutstuff.org, or some local craft stores such as Michael's. 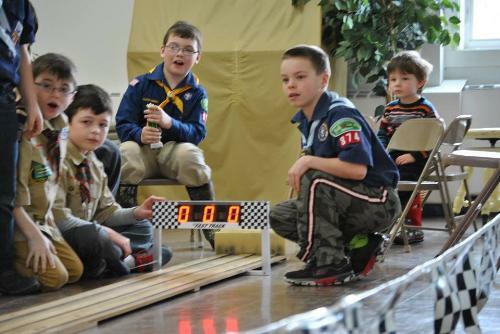 Top three winners in each Cub Scout division will advance to the District Pinewood Derby. At the conclusion of your division, please indicate to the pit crew if you plan to attend the District race in April (see details below). Location and start time will be announced by the District Race Committee Chairman. Typically the race order is by rank starting with Tigers. We suggest checking your car in early and returning for the race start. If you wish to apply graphite to your wheels, do this BEFORE you arrive. Once you check your car in, it is placed in the "pit" and can not be touched or modified. Food and refreshments will be available so bring some spending money and appetites along with you cars! Due to the large number of scouts who attend this event, the format is slightly different. Volunteer Scouters will handle and race the cars while each rank observes the race. Winners are determined by the fastest average time of three races and will be announced at the conclusion of all races.